The beautiful hardwood-style flooring in our Springs luxury apartment homes is low-maintenance, but what about the carpeted areas? Does your head hurt just thinking about keeping them clean? Relax... it's not as hard as you think. We've put together a list of our management team's best tips for keeping your apartment carpets looking like new. This is the most important thing you can do to extend the life of your carpets. Vacuums do more than remove surface debris. They pick up the deep-down dirt that gets ground into the carpet fibers, adding to the wear and tear. Using rugs to cover frequently-traveled areas is attractive as well as practical. 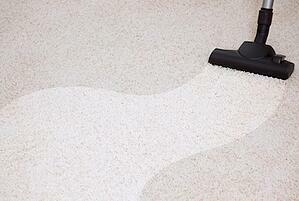 Just as they do with clothing, carpeting stains become set if they're not treated immediately. There are a number of commercial spot removers on the market, but you may have better results with DIY natural cleaners that are specific to the type of stain. Make sure your dog is completely apartment-trained and take him out frequently for potty breaks. If you have a puppy or a dog who is still prone to accidents, potty-pads can help. When your dog comes in from a walk or a play session at our off-leash dog park, wipe off his paws gently but thoroughly to prevent dirt and debris from getting tracked inside. Shoes track in a wide variety of substances and place excessive stress on carpet fibers. Consider putting a mat by the front door so people can remove their shoes right away. No matter how much TLC you give your carpet, it doesn't match the benefit of a professional steam cleaning. Schedule a full cleaning once a year — your carpet will thank you. Have a can't-miss carpet maintenance tip to share? Let us know in the comments!